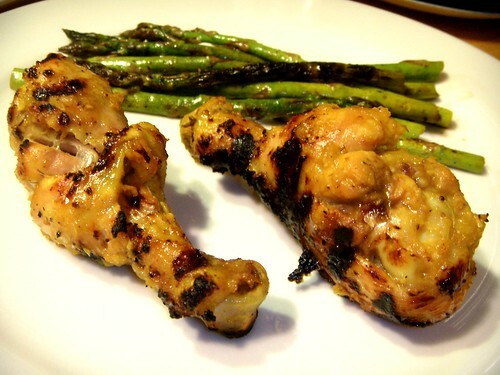 turmeric-miso reverse-braised grilled chicken with balsamic caramelized asparagus, originally uploaded by aarn! +11th March, 2009+. a bundle of asparagus, tough stalk ends removed, were tossed in a large bowl containing 1T. canola oil, 1T. balsamic vinegar, salt, pepper, and a pinch of sugar, until lightly coated. the asparagus was transferred to an oiled hot grill with the tips as far away from the heat source as possible, until still firm but slightly crispy and the coating had caramelized a bit.